Katie Cotugno had me at her first novel, How to Love, and even more so with her second in 99 Days. I was consumed, enamored, and swept up in the craziness of Molly’s summer back home. I couldn’t wait to finish her story. Can I just say that Molly’s love life was one big unexpected roller coaster ride?! It was very compelling to read because throughout the book, she struggles with the stares, the whispered remarks, the cruelty of her old friends turning on her all the while having the Donnelly brothers back on her radar. She tries her hardest to get through the days that she has until she goes back to school. During this summer back home, Molly tries to find herself, figure out what she wants in life, mend the friendships she lost, and ultimately decide whether to fix what was broken between her and the Donnelly brothers. Right off the bat I knew that Molly would be a tough character. I would have either disliked her from what she did or go head first into her world and see her side of the things. So I have to say that reading 99 Days, you will need an open mind about Molly because I promise that Cotugno will show you the truth. And while the truth is not easy to read you will develop a totally different perspective and understanding in Molly’s situation. 99 Days is not just about Molly getting through those days, but showing you what lead to Molly and Gabe’s indiscretion. Molly is not perfect by any means and she does make some major mistakes in this book. But for all the wrong choices she made, I still loved her. She was still a bright, smart young girl who had a lot to offer. She didn’t just mope around or hide all summer. She actually made her 99 days work for her. And even with what happened between her and the Donnelly boys, she didn’t deserved to be ridiculed and bullied or driven away from her home. I also thought this book really showed the unfairness of how Molly got all the backlash, all the hate while Gabe barely had any. No one that was really close to Molly put a stop to it. It was not to say that Gabe didn’t have any sort of consequence with what happened, but it was plainly obvious that it wasn’t as harsh as the way Molly was tormented. She wasn’t the only at fault, but in a situation like this, she was put as the ultimate bad guy for coming in between the brothers. It really sucked to have to see all that hate geared toward Molly. 99 Days is not a second chance love story, and in my opinion I don’t think it’s a love story at all. Sure, there was romance, but that wasn’t the point or the message I read in between the lines. I thought it was about forgiveness, friendship, and self-discovery. It was about learning from one’s mistakes and becoming the bigger, better person. And I think Molly did that. Like I said, she’s not such an easy character to love or even like, but you really learn to see her side of things, you feel for her as a person. Overall, I thought 99 Days was a really good book. You have to read Molly’s story to understand the bigger picture between her and the Donnelly boys. I think readers will appreciate a character who makes huge mistakes as a human can do and learn to deal and move forward because of it. But when her dad moves out and her mom loses it, Juliet begins questioning the rules she’s always lived by. And to make everything even more complicated there’s Declan, the gorgeous boy who makes her feel alive and spontaneous—and who’s totally off-limits. 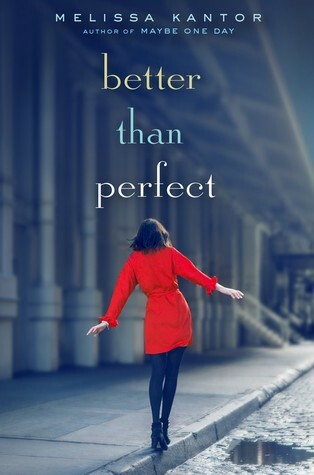 Torn between the life she always thought she wanted and one she never knew was possible, Juliet begins to wonder: What if perfect isn't all it’s cracked up to be? Melissa Kantor once again delivers a tale that is equal parts surprising, humorous, heartbreaking, and romantic. Powerful and honest, Juliet’s story brilliantly portrays the highs and lows of life in high school and will resonate with any reader who has experienced either. I fell in love with Melissa Kantor’s Maybe One Day. It tugged on my heart strings and stayed with me long after I finished the novel. It was only natural for me to be intrigued by her following book, Better Than Perfect. I was excited to dive into the book and I was ready for many emotions to come pouring out of the page. Sadly, I did not get the feels from Better than Perfect the way I did with Maybe One Day. Better Than Perfect hints on the realization that the aspirations and dreams that a person strived for isn’t what they wanted after all. This is all seen through the main character, Juliet, who supposedly leads a perfect life with a good family and loving boyfriend and a bright future at a prestige university. While this all seemed something I or anyone could relate to, my detachment and utter lack of concern or care for Juliet was impossible to ignore. It was already apparent that Juliet didn’t have a perfect life (who does anyway?) and was not entirely happy with the lot she had. Throughout the course of the book, Juliet faces the dilemma of deviating from all she has ever known and loved and planned while giving in to the urge to try something totally different like dying her hair and singing in a rock band. This all sounded oh so interesting, but lacked in delivery and development and left me bored. Many points, conflicts and topics get touched on like Juliet’s mother’s depression and her strained relationship with her father. Those were probably the best parts because of the way the whole perfect concept got shattered by her family. It was the pushing moment to get Juliet to explore other possibilities. However, it wasn’t the center of the book. Those family developments were few and far between and had me wishing there was just...more. The ultimate let down was Juliet’s journey to figure out what she wanted. She really just skated on by with her boyfriend, doing random things and most of the things she did and tried I forgot because they weren’t really important or worthy of remembrance. This especially goes for the misleading romance vibe I got from the summary with Declan. I thought it was a pointless plot line that didn’t tickle my fancy at all. The message was supposed to be clear cut about being able to lead a life you want without hindrance but this got lost in the void with Juliet’s choices and how much I really couldn’t care for her feelings. I was mostly disappointed by her actions until the very end where she finally pulls herself together a little too late for my taste. In case you're wondering, this is not a love story. My name is Tori Spring. I like to sleep and I like to blog. Last year – before all that stuff with Charlie and before I had to face the harsh realities of A-Levels and university applications and the fact that one day I really will have to start talking to people – I had friends. Things were very different, I guess, but that's all over now. I don't know what Solitaire are trying to do, and I don't care about Michael Holden. To be quite honest, while I was reading Solitaire, I wasn’t exactly sure what in god’s name the book was really about and what the freaking point was until near the end. But I enjoyed the mysteriousness of what Solitaire was, how it was true to the tagline of not being a love story and how the writing felt like one flow of conversational thoughts that just clicked and worked for the main character. Meet a non optimistic, bored, teenaged girl in her Year 12 named Victoria Spring or Tori for short. I thought I wouldn’t like this girl, but the more she showed who she was, I sort of kind of fell for her. She had little quirks about herself that made her interesting such as her not liking people, how she really could care less about certain things, how she was awkward, how she hated the invention of the phone, but loves to blog. Tori was comically cynical and perpetually sarcastic, and her slightly pessimistic demeanor about school and her life in general was refreshing. She was snarky at her best and sleepy at her worst and I liked her for being so brutally honest and opinionated despite the fact that she hated reading books and Disney moves and had an uncanny ability to have a negative comment about anything and everything. But she was entertaining, yet relatable because she struggled with school, starting conversations with people and making friends. She just felt like a genuine, authentic teenager you could meet these days. To counter the pessimistic attitude from Tori, there was Michael. He was the opposite of Tori in a lot of ways, but at the same time he also thought like her too. He just didn’t show it or voice it as much as she did on the outside. Michael was eccentric and loud at best and wacky and weird at his worst, which wasn’t really all that bad if you ask me. He would pop up at the most randomest of times and wouldn’t fail to find Tori and kind of make you laugh and put a smile on your face. There was just something about his oddness and his energetic nature that was hard to ignore. The only way to really find out about Solitaire is to just read, experience it, and take it all in. This goes for what Solitaire actually is in the book and the whole book itself. I felt this book was more about Tori and how she saw her life and other things and people and how she felt. There was no rhyme or reason to her thoughts or actions. Her inner thoughts and verbal monologues were super entertaining and full of sarcasm. With the mysteriousness of Solitaire this allowed the pacing and plot of the book to propel forward. There were also little side plot lines that took hold of my attention and I’m sure will do the same to other readers. There was definitely something edgy and realistic about the nature of Solitaire as a book and this definitely had to do with some of the topics of suicide, depression, etc. that got explored here. 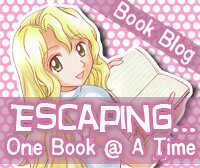 Like I said, the book’s tagline is true to its word, however, the lightness of Tori and Michael’s friendship really was adorable and quite hilarious so I don’t think the lack of a love story hinders it. What really stood out with Solitaire is how authentic it is in teenage voice and mind. Nothing is sugar coated and Tori’s blunt responses and thoughts are sometimes uncalled for but they give a refreshing point of view. 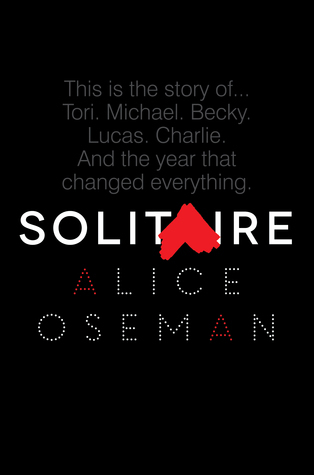 Solitaire is definitely a different book that many will have various thoughts and feelings on, but I for one really enjoyed it and had a good time reading it. 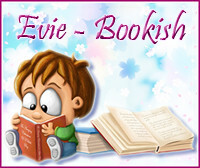 *Thanks HarperTeen for the opportunity to read this book in exchange for an honest review. Oh Rowdy! I never thought the day would ever come that I finally got to read your book and get to know all about you and your Anchor tattoo and pompadour styled hair. You absolutely, positively, indefinitely, slay me. You really really do. You were everything I hoped you would be, book and character and so much more. So much more. What can I say, I was a big fan from book one til now and wowza, I seriously could not get enough of you! I already knew there was something special and unique about Rowdy, as was for the Marked Men. But Rowdy had that eat your heart out, play boy, will never ever settle vibe going on and then and then...I get a glimpse of the broken hearted, I let the one pass me by side that had me wishing I could cuddle him to my side forever. His story and past became a mystery I wanted to uncover. Each bit I did unravel while reading this book had me irrevocably attached. I was hit by Rowdy’s compassion, his loyalty, his desire to loved and wanted and cherished. There was just more depth to his personality, to who he was as a person and as a man. He had some major vulnerabilities and insecurities that you wouldn’t have thought was there, but this just made him more human, more reachable as a fictional character. When it came to Rowdy’s romance with Salem, this was where he showed that broken side of him and the fear he harbored. Watching these two fall in love was beautiful. They weren’t perfect, both had issues to contend with whether it was from the past or the unknown future ahead of them. I liked that Rowdy and Salem had history. They had room to learn from their mistakes and grow to be independent people who can love one another. Salem was a great match for Rowdy. She was his perfect girl with her flirtatious nature and come right at you attitude. She was bossy, and witty, and caring all wrapped in her tattooed pin-up girl look that totally rocked. They worked even though they felt like it wasn’t going to and lets be honest, they were hot as hell together. They had the best chemistry and sexual tension that just built up nicely and exploded epically. Rowdy and Salem were just amazing together. Jay Crownover continues to floor me with each and every book she delivers brilliantly in the Marked Men series. I always end up devouring the current book and aching for the next. It’s an addiction I refuse to shake off. Every book keeps giving glimpses of characters that I have fallen so deeply in love with and when it comes time for their turn to be front and center, it’s inevitable that my love for that character expands and extends and gives me all kinds of ooey gooey feels. And boooooy was I feeling them feels with Rowdy 100 percent of the way! 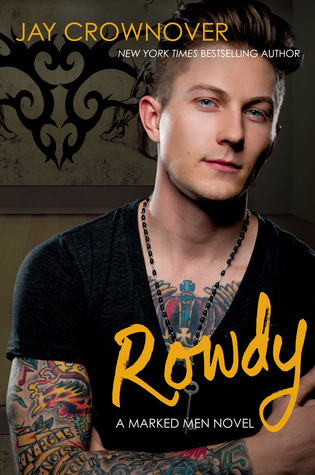 ROWDY was exceptional and I cannot wait for more!